This article is about worldwide phenomenon. For the article specific to the United States, see Feminist art movement in the United States. The feminist art movement refers to the efforts and accomplishments of feminists internationally to produce art that reflects women's lives and experiences, as well as to change the foundation for the production and reception of contemporary art. It also sought to bring more visibility to women within art history and art practice. 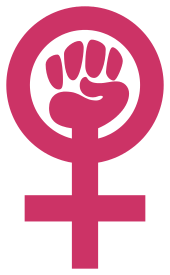 Corresponding with general developments within feminism, and often including such self-organizing tactics as the consciousness-raising group, the movement began in the 1960s and flourished throughout the 1970s as an outgrowth of the so-called second wave of feminism. It has been called "the most influential international movement of any during the postwar period." The 1960s was period of civil rights and gay and lesbian rights movements and protests against war. It was also a period when women artists wanted to gain equal rights as men within the established art world, influenced by modernist movements "utopian ideals," and to create feminist art, often in non-traditional ways, to help "change the world." Louise Bourgeois (1911-2010) and German-American Eva Hesse (1936-1970) explore some of the themes in feminist art, like domestic life, personal experience and the women's body. On 20 July 1964 Yoko Ono, an avant-garde artist, singer, and activist, presented Cut Piece at the Yamaichi Concert Hall, Kyoto, Japan where she sat still as parts of her clothing were cut off of her, which meant to protest violence against women. She performed it again at Carnegie Hall in 1965. Her son, Sean, participated in the artist performance on 15 September 2013 at the Théâtre le Ranelagh in Paris. The Guardian's Jonathan Jones considered it "one of the 10 most shocking performance artworks ever." Women artists, motivated by feminist theory and the feminist movement, began the feminist art movement in the 1970s. Feminist art represented a shift away from modernism, where art made by women was put in a different class to works made by men. Or, as Griselda Pollock and Roszika Parker put it—a separation of Art with a capital "A" from art made by women produced a "feminine stereotype". This demand for equality in representation was codified in the Art Workers' Coalition's (AWC) Statement of Demands, which was developed in 1969 and published in definitive form in March 1970. The AWC was set up to defend the rights of artists and force museums and galleries to reform their practices. While the coalition sprung up as a protest movement following Greek kinetic sculptor Panagiotis "Takis" Vassilakis's physical removal of his work Tele-Sculpture(1960) from a 1969 exhibition at the Museum of Modern Art, New York, it quickly issued a broad list of demands to 'art museums in general'. Alongside calls for free admission, better representation of ethnic minorities, late openings and an agreement that galleries would not exhibit an artwork without the artist's consent, the AWC also demanded that museums 'encourage female artists to overcome centuries of damage done to the image of the female as an artist by establishing equal representation of the sexes in exhibitions, museum purchases and on selection committees'. There are also feminist forms of postmodernism which emerged in the 1980s. The feminist art movement grew out of the struggle to find a way to express sexual, material, social and political aspects of life—and to femininity—in a new way. Feminist art movements emerged in the United States; Europe, including Spain; Australia; Canada; and Latin America in the 1970s. Since then, there are women's art movements in Sweden, Denmark and Norway, Russia, and Japan. Women artists from Asia, Africa and particularly Eastern Europe emerged in large numbers onto the international art scene in the late 1980s and 1990s as contemporary art became popular worldwide. Major exhibitions of contemporary women artists include WACK! Art and the Feminist Revolution curated by Connie Butler, SF MOMA, 2007, Global Feminisms curated by Linda Nochlin and Maura Reilly at the Brooklyn Museum, 2007, Rebelle, curated by Mirjam Westen at MMKA, Arnheim, 2009, Kiss Kiss Bang Bang! 45 Years of Art and Feminism curated by Xavier Arakistan at Bilbao Fine Arts Museum, 2007, Elles at Centre Pompidou in Paris (2009-2011), which also toured to Seattle Art Museum. have been increasingly international in their selection. This shift is also reflected in journals set up in the 1990s like n.paradoxa. 1 2 "Feminist art movement". The Art Story Foundation. Retrieved 13 January 2014. ↑ Jarett Murphy (16 October 2003). "Crowd Cuts Yoko Ono's Clothing Off". CBS News. Retrieved 12 January 2014. ↑ Jonathan Jones (11 November 2013). "The 10 most shocking performance artworks ever". The Guardian. Retrieved 12 January 2014. ↑ Roszika Parker; Griselda Pollock (1981). Old Mistresses: Women, Art and Ideology. Pandora, RKP. ↑ Harrison, Charles (2000). Art in theory (Repr. ed.). Oxford [u.a. ]: Blackwell. pp. 901–2. ISBN 0-631-16575-4. ↑ Entry on feminist art practice by Katy Deepwell in Cheris Kramarae; Dale Spender, eds. (1 December 2000). Routledge International Encyclopedia of Women: Global Women's Issues and Knowledge. Taylor & Francis. pp. 92–93. ISBN 978-0-415-92088-9. ↑ Gislind Nabakowski; Peter Gorsen; Sander Helke (1980). Frauen in der Kunst(2 Vols.). Frankfurt,Suhrkamp. ↑ Catriona Moore (1994). Dissonance: Feminism and the Arts, 1970-1990. Allen and Unwin and Artspace. ↑ see Andrea Giunta's, Feminist Disruptions in Mexican Art, 1975-1987 in Number 5 . (c) Artelogie, October 2013. ↑ Hindsbo, Karen. The Beginning is Always Today: Scandinavian feminist art from the last 20 years. SKMU, Sørlandets Kunstmuseum, 2013. ↑ Kokatsu, Reiko.Women In-Between: Asian Women Artists 1984-2012. Japan, Fukuoka Asian Art Museum, 2012. ↑ Huangfu, Binghui. (ed).Text and Sub-Text(Singapore: Lasalle-SIA University, 2000. ↑ Connor, Maureen (Summer 2002). "Working Notes: Conversation with Katy Deepwell". Art Journal. 61 (2): 32–43. JSTOR 778180. Juan Vicente Aliaga Gender Battle/A Battala dos Xeneros Spain, Santiago de Compostela, 2007. Juan Aliaga and Maria Laura Rosa Recuperar la Memoria: Experiencias feministas desde el Arte, Argentina y Espana, Ana Navarette and Mujeres Publicas Centro Cultural de Espana, Buenos Aires and CCEBE, Sede Parana, 2013. L. Anderson, A. Livion Ingvarsson, M. Jensner, A. Nystrom, B.Werkmeister, N. Ostlind (eds.) Konstfeminism Helsingborg, Sweden, Dunkers Kulturhaus and Lilevalch Konsthall, 2004. Kathy Battista Re-Negotiating the Body: Feminist Art in 1970s London, I B Tauris, 2011. Carla Bianpoen, Farah Wardani, Wulan Dirgantoro Indonesian Women Artists Jakarta: Yayasan Semirupa Indonesia:2007. Katy Deepwell (ed) New Feminist Art Criticism: Critical Strategies UK, Manchester, Manchester University Press, 1995. Sylvia Eiblmayr Die Frau als Bild: Der weibliche Körper in der Kunst des 20 Jahrhunderts Berlin, Dietrich Reimer, 1993. Isabelle Graw Die bessere Hälfte: Künstlerinnen des 20. und 21. Jahrhunderts Cologne, du Mont Verlag, 2003. Karen Hindsbo The Beginning is Always Today': Scandinavian feminist art from the last 20 years Norway: Saarlandets Kunstmuseum, 2013. Johanna Householder and Tanya Mars (eds) Caught in the Act: an Anthology of Performance Art by Canadian Women Toronto:YYZ Books, 2003. Lucy Lippard From the Center:Feminist Essays on Women's Art New York. Dutton, 1976. Roszika Parker and Griselda Pollock Framing Feminism: Art and the Women's Movement, 1970-1985 London. Pandora/RKP, 1987. Griselda Pollock (ed) Generations and Geographies London, Routledge, 1996. Hilary Robinson (ed) Feminism – Art – Theory: An Anthology, 1968-2000 Oxford. Blackwells, 2001. Araceli Barbosa Sanchez Arte Feminista en los ochenta en Mexico: una perspectiva de genero Mexico: Casa Juan Pablos Centro Cultural, Universidad Autonoma de Estado de Morelos, 2008. Bridget Tracy Tan Women Artists in Singapore Singapore, Select Books and Singapore Art Museum, 2011. Jayne Wark Radical Gestures: Feminism and Performance Art in North America Montreal: McGill-Queen's University Press, 2006. Women Down the Pub (a.k.a. N.Debois Buhl, L.Strombeck, A.Sonjasdotter) Udsight – Feministiske Strategier i Dansk Billedkunst / View – Feminist Strategies in Danish Visual Art Denmark, Informations Vorla, 2004.